Michael Hyatt & Co. recently landed on the Inc 5000 list of the fastest growing private companies in America for the second year in a row. That’s a huge honor, and it represents how fast our team of high-achievers moves from one project to the next. As the company has grown, so has our team—we now have more than 30 full-time employees across a half-dozen departments. This year, we hit a breaking point where we realized that “What got us here won’t get us there” and we restructured our entire collaboration and project management approach, company-wide. Before making any radical changes, we formed a project management taskforce, including one or two members from each team, and made a list of the features we needed in a project management tool. We needed a way to plan long-term projects, manage short-term sprints, and collaborate across departments―all in one tool. We quickly ruled out Trello and Monday as tools which were missing key features we needed, and while Todoist and Nozbe are well-loved by many members of our team they are primarily focused on individual task management, with project management as a secondary focus. That left us with two final project management apps for our taskforce to test: Basecamp VS Asana. While both tools are well-equipped for managing multiple, complex projects, Basecamp had serious limitations when it came to cross-functional collaboration between different departments on fast-paced projects―and by comparison, Asana was simply more intuitive to use. One of the key reasons Asana serves us so well is because it provides multiple lenses for looking at the same project from distinctly different views. At its core, a project is made up of a collection of interrelated tasks, but Asana adds a second distinction by making it simple to break up a project into sections of tasks. The project view provides leaders with a high-level perspective, and shows team members how their assignments fit into the bigger picture of whatever initiatives are going on. Asana includes the built-ability to view the same project from a calendar, timeline, or summary view. Each task is assigned to a specific person, which allows them to view their assignments in a personal “My Tasks” feed, which can be individually sorted by due date, priority, or project. One of the reasons why people love Trello so much is because it’s a visual tool, allowing you to view projects in a card-based layout and drag items from column to column to demonstrate progress rather than simply waiting to check them off. This concept, called a Kanban board, comes from Toyota’s approach to continuous manufacturing by moving work-in-progress products from one phase to the next. While list-based projects are often better suited for planning out the details of a large project, they can be limiting when you’re in the messy middle of any project where a lot of tasks are half-done. 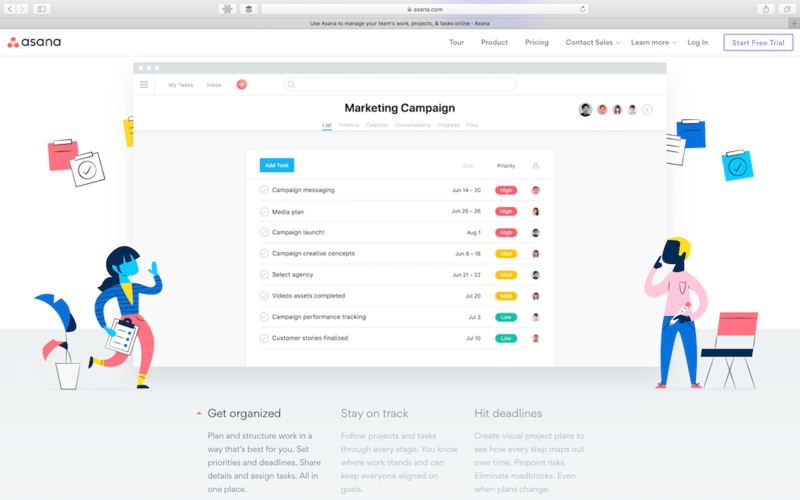 Asana allows you to create any project in a list or board format and also lets you add the same task to multiple different projects (without duplicating the individual task). That means you can create a list-based project to outline the comprehensive vision for the project and also create a board project to visualize your team’s weekly priorities or current work-in-progress tasks. Ever since we started using Slack, we’ve relied heavily on the fast-paced communication that Slack makes possible with a mostly remote team. We have a well-developed system for how we use Slack, so we one of our first priorities with a new project management tool was to determine how the tools play well together. Thankfully, many other companies have had the same questions before, which is why Asana has developed an incredibly robust integration with Slack. Within Slack, a quick chat can turn into a new task or update to an ongoing task with just a few clicks. Without constant communication (or micromanaging), it’s easy to get lost without knowing the details of how each project is doing at any given point. Glancing at a project is helpful only if the information you need is available at a quick glance. That’s why we quickly adopted that habit of using Asana’s labels, or “Tags” to add color-coded updates to tasks when the need comes up. A yellow “Waiting” tag signifies a task is on hold until after a meeting, decision, or another task is complete. A red “Roadblocked” tag is typically more intense, meant as a flag for tasks which are stuck without a clear path out until a senior leader steps in. Which tags your team uses is completely custom, recently we added a pink “Cross-functional” tag to make special note of tasks that require contributions from multiple teams. From the project view, these colors and labels are immediately visible, providing a snapshot status update at any point. When you start using Asana, the app comes pre-loaded with a suite of project templates you may find helpful (especially the “Asana Onboarding” template which walks you through the app). Even better, Asana allows you to easily convert any project into a re-usable template you can use to get more done in less time. Chances are, you have similar projects you repeat often. Taking a few minutes to create a project template will save you time getting started each time. The first template we created was for our product promotions, so we could break our launch projects into five distinct phases and space the work out over time. At the end of the day, no specific software, app, or other tool is going to be the deciding factor in whether or not your business succeeds. But when you’re managing high-paced projects with a team of high-achievers, you need a tool like Asana that helps you lead effectively without getting deep into the weeds yourself.